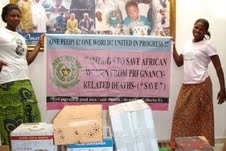 The Sweet mother International (SMI) Team in Cote d'Ivoire is assisting mothers and babies by donating 'Box of Love' to rural women in Cote d'Ivoire, particularly, new and expectant mothers living in remote communities in the country. According to Traore Thiam Djénébou, the SMI Coordinator in Cote d'Ivoire, the 'Box of Love' is provided to improve the well being of mothers and child. We have also successfully donated gifts (clothes, kitchen utensils, costume jewellery,... in short female products), to women who are raising orphaned children whose mothers died prematurely from childbirth or other conditions. 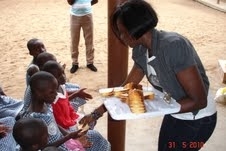 The "SAVE" Team in Cote d'Ivoire feeds and donates food to orphans in Abidjan. 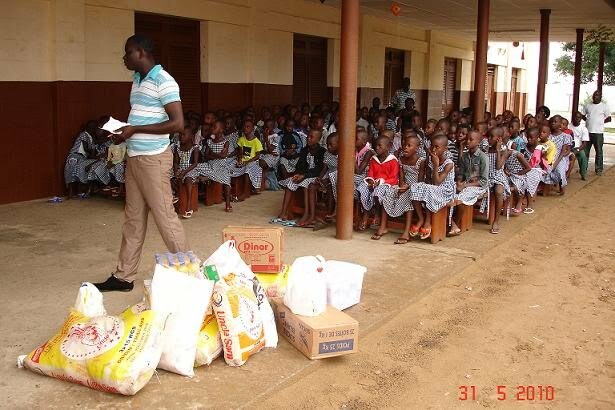 Children who have lost their mothers as a result of pregnancy complications and other causes received food packages including: bags of rice, cartons of sugar, crates of energy drinks and fruit juice etc. Thanks to the "SAVE" team for their great service to humanity and their warm heart of compassion to the less privileged. In May 2010, the “SAVE” team held meetings with community leaders and groups; the aim is to educate the community about maternal health and also, to tell them about the empowerment programs of Sweet Mother International. 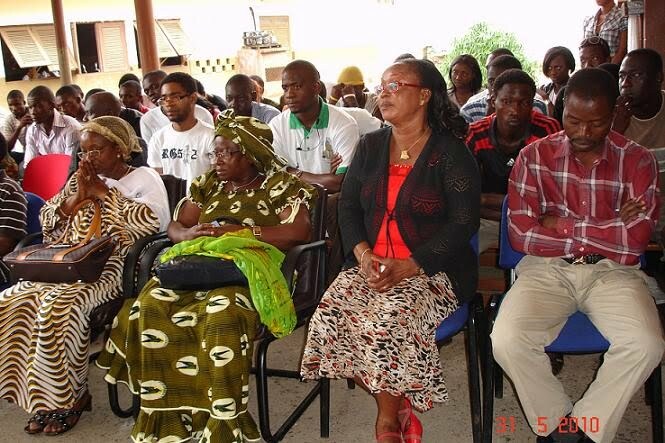 According to Traore Thiam Djénébou, the SMI Country Coordinator, "the communities were very happy and greatly supported the “SAVE” message. They all want this event to become an institution and for it to be repeated each year so that we do not forget our sisters who died as a result of giving birth. They indeed, expressed so much passion in the cause and prayed that, henceforth, there shall be no more treatable pregnancy complication deaths in my country." At these meetings,donations were made (clothes, kitchen utensils, costume jewellery, female products). 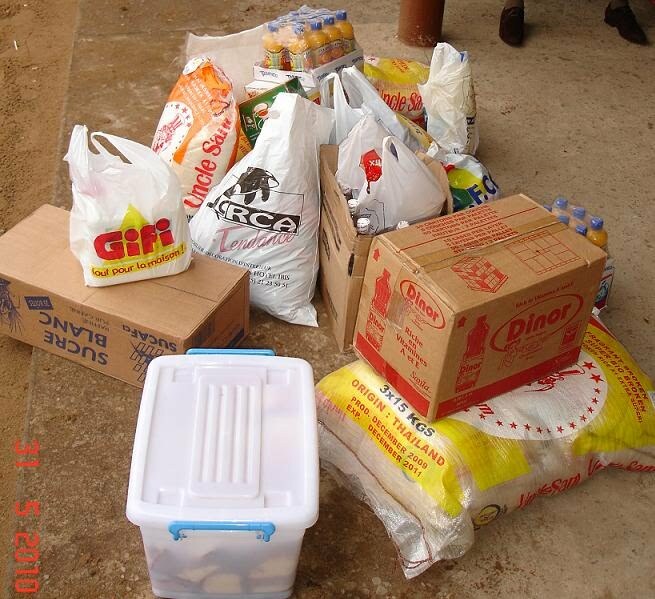 These products were distributed to sisters, mothers, aunts who agreed to raise the orphaned children whose mothers died prematurely from childbirth or other conditions. Everyone, pledged to continue to support and work towards the eradication of avoidable pregnancy related deaths in Côte d'Ivoire. • The Great Mosque of Port Bouet, Town of Port Bouet, one of the largest municipalities in the south of Abidjan. We have already briefed the Imam of the mosque and the mayor of Port Bouet is also informed about the “SAVE” campaign programs. Our awareness procession will depart the Port Bouet “Foyer Polyvalant” room and head towards the main mosque in front of the public elementary school, square SICOGI. • The Church of Blockauss, Commune of Cocody in Abidjan North. As modern social environment, the choice of Blockauss meets a rather unusual test of its location, it is a "village EBRIE" which opens on the shelf lagoon, has a Blockauss beach area making it a peninsula. We have already briefed the traditional chiefs Blockauss of Blockauss and the mayor of Cocody about the “SAVE” campaign. We will hold a rally in this area, starting from the Residence Cocody Chief and head towards the church, near the quarter of embassy. • The Tengrela Mosque in northern Côte d'Ivoire, this is our village. The residents were informed during a mission that we've fielded in Tengrela (800 km from Abidjan in the far north, this area is a disaster zone because of the war in our country). The mission was able to reunite mothers; we also inform them about Sweet Mother International and the message of hope offered through the “SAVE” campaign programs.